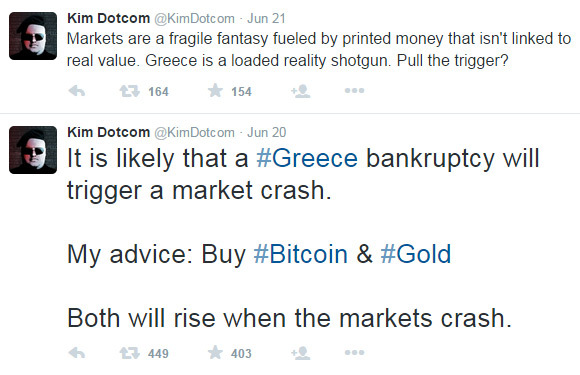 In a recent tweet about a high possibility of Greece’s bankruptcy leading to a market crash Kim Dotcom advices people to invest in Gold and Bitcoin in order to stay safe. It is up to you to listen or not to that advice, but we think that it may not be wise to ignore it completely. Kim Dotcom has been promoting the use of crypto currencies such as Bitcoin for some time now and it is highly possible that he also has plans for integrating crypto currency support in high projects such as the MEGA file upload service and. With that said he is also a controversial figure, but the situation in Greece is not looking good and they may as well be headed for bankruptcy and if it happens it will influence not only the European markets. With such an advice you might want to check out the service BitGold where you can not only buy Gold with fiat or Bitcoin, but also use it as a means for digital payments or redeem it as physical Gold if you wish to.